4 It’ll stunt your growth! 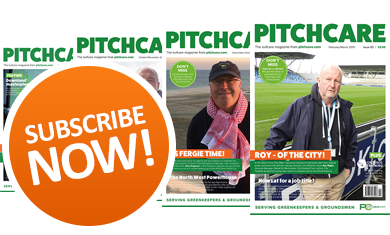 Climate change is starting to wreak havoc with Britain's sport and leisure facilities, as sportsgrounds and venues increasingly begin to bake in summer then flood in winter. Such extremes of weather are requiring councils to revise their maintenance policies to keep within budget and also to optimise use - a tough challenge. For outdoor sports facilities, the milder weather offers the attraction of a longer playing season, and with it the prospect of raised income. However, milder weather also encourages a longer growing season for turf, which is why more councils are considering retardants as one way to limit growth and keep a lid on the volume of green waste they generate. 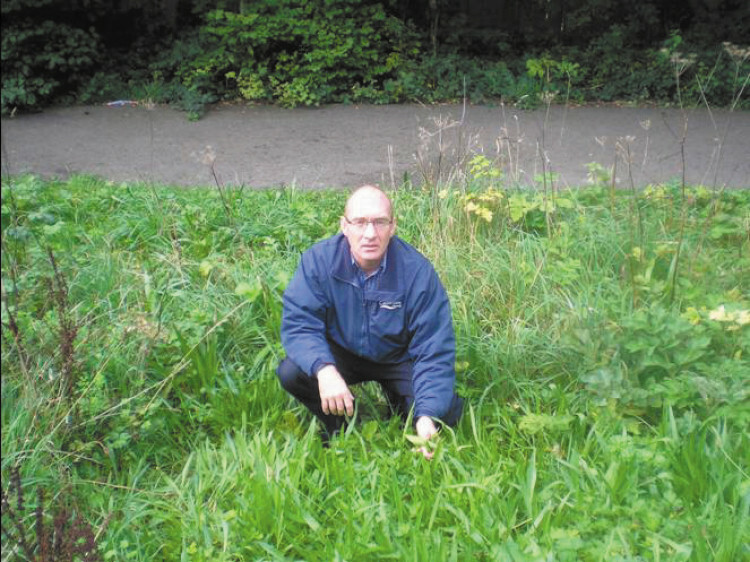 The concept of using growth retardants to manage the rate of grass growth in the grounds maintenance and turf care industries, while not new, has taken a new turn in Yorkshire, where Mark Dempsey, Parks and Street Scene Central Support Manager for Calderdale Metropolitan Borough Council, has turned their application on its head. Mark's role is to foster a greener, cleaner, safer environment for parks, municipal green spaces, streets and highways and to focus on environmental issues and sustainability. "It's a broad area to cover," says Dempsey, who has some thirty years experience in practical amenity horticulture, "but the council is very environmentally proactive and committed to improving the community's health and facilities." After attending last year's BTME show in Harrogate, Dempsey decided to set up a trial of a growth retardant along the Sustrans Hebble Trail near Halifax in a bid to suppress the growth of native grass species and establish wildflower colonisation. Begun last summer, the trial has been a success even allowing for extremes of hot and wet weather. The three profile areas were non-maintained natural grass containing wildflower species, an area treated the previous winter with a total translocated glyphosphate herbicide then planted with native wildflower plug plants, and an area of natural grass, again planted with native wildflower plug plants. "The results were positive and, in all three areas using Syngenta's turf growth regulator Primo MAXX, supplied by Scotts, wildflowers became dominant over the native grass and also allowed the young wildflower plugs to establish themselves. No mowing was needed until autumn." Mark's vision for growth retardant use has spread to highways and now to bowling greens. "The Hebble trial's aim was to try and establish use of growth retardants as part of Calderdale parks and street highway maintenance regimes to reduce operator exposure to potential road traffic accidents." "We have been trialling the product on a central reservation where a one metre wide strip next to the road is treated, enabling operators to work nearer traffic less frequently because there are fewer cuttings needed. Fuel savings alone can pay for the cost of the chemical and we are reducing the volume of green waste generated." Now Calderdale's twenty bowling greens are set to receive regular treatment too if trials, which began in April on one of them, prove successful. 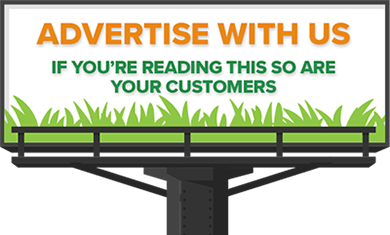 The tradition of lawn bowls, particularly Crown Green, is especially strong in northern England, although there are concerns that a new generation of participants is proving slow to come forward to ensure the future prosperity of the sport. 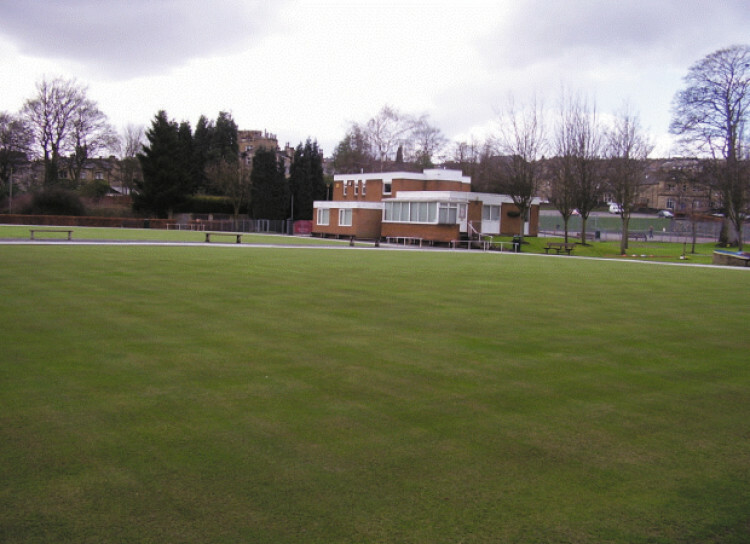 Woodvale Bowling Club, whose headquarters is sited in Wellholme Park, Brighouse, boasts 300 members - most have played on the site for many years. 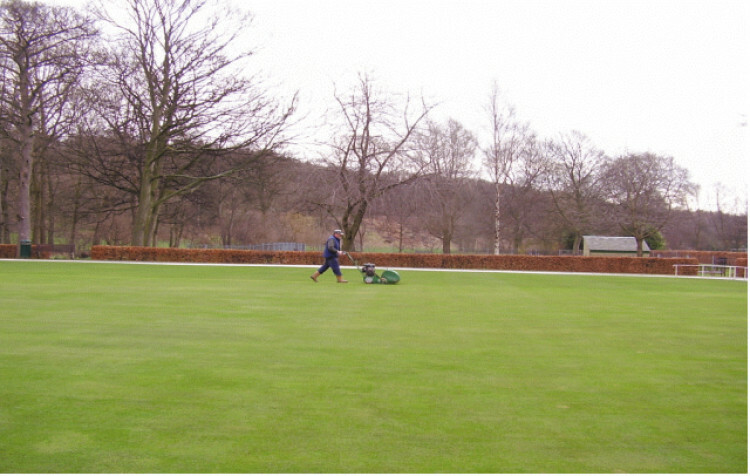 The performance of Wellholme bowling greens, two Crown Green and another catering for blind players, is benefiting from a partnership working arrangement between Robert Bone from Scotts, Brian Mansfield, Calderdale Council's area manager and groundsman, Glen Lyon. Mark takes up the story. "The project began back in 2004, when soil samples were taken from the main green. These highlighted the need to change the fertiliser requirements and build up a planned programme of maintenance." 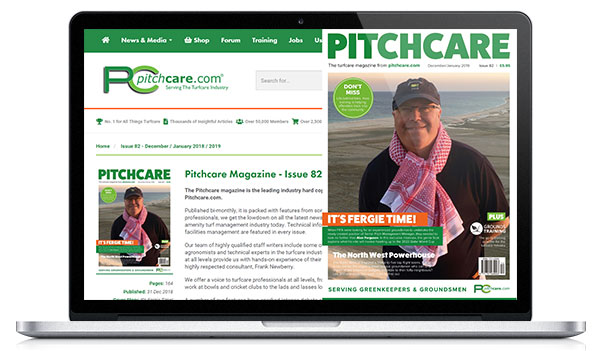 "In July 2006, one of the Wellholme greens was sprayed with Primo MAXX, just before the region suffered one of the driest and hottest spells ever recorded. It was decided that the trial was not accurate because of the extreme climatic conditions." But other factors also came into play, as Mark recalls. "Maintenance standards waned during this period as Glen was on holiday; the greens browned off due to drought stress and we were unable to keep up with the irrigation required to maintain sward standard." Last year's extremely dry period, which began on 29 June and lasted until 23 July saw the fine turf greens turn into a desert in the teeth of drought and a hosepipe ban. With fungal invasions, such as anthracnose, a persistent danger when the greens turf is parched, Mark approached the club with his proposal to test Primo Maxx under trials that he believed could transform the look and condition of the greens. "I want to do more at Wellholme to improve the standard of the bowling greens, and I think there is a great deal that the product can do." "Four or five applications are needed before the end of June if possible so that we avoid the very hot weather." Results from earlier trials with Primo Maxx confirm its effectiveness. "The regulator slows the growth of the apical meristem but greatly increases the root biomass and depth of penetration - by up to 40% we calculate." The bigger, stronger, rootzone can tap into readily accessible water sources deeper down, he adds. The regulator offers what amounts to the best of both worlds for turf maintenance. "It slows down the rate of cell elongation above ground, while bulking up the root biomass, so energy supplies to the turf are going downstairs not upstairs. The result will be shorter turf and a darker green, tougher sward that will retain its colour for longer into the year." The trials could not have come at a more opportune time for Calderdale. Wellholme Park clinched a Civic Trust Green Flag award last year and is bidding for a second this year. Achieving these accolades means that the park has met several stringent criteria such as health, safety, security and environmental sustainability, "We are also using it as a model for ENISO14001 - the government environment management system - which tasks us to show improvements in environmental practices." • Less green waste going to landfill sites. The change to, and concept of, use of growth regulators is not new, with many compounds of maleic hydroxide in use since 1980. It was the external pressures of increased awareness of and regulation for effect management of all environmental issues - even including cutting fine turf grass on a municipal bowling green - that drove the change. "By suppressing grass growth, I believe we will be able to reduce the need to cut the bowling greens by a third," predicts Mark. The pressure is on though, as Mark explains. "The current bowling season stretches from March to October and the timing of applications - namely April, May, June and July will be a key element to the trial. We also want to present the findings at the Green Flag celebration event in July." The chemical is effective and works by blocking the production of gibberellic acid late in the growth cycle of the grass, which effectively limits cell elongation during the normal period of monocotyledon plant growth. The chemical does not affect dicotyledon plants. This results in a shortening of the distance between the shoot nodes, leading to more compact growth. While the vertical growth is slowed, both the root and lateral growth are boosted creating a stronger, healthier and denser turf. Gibberellins are a class of plant growth substances that stimulate cell division and/or cell elongation and other regulatory functions. Gibberellins are noted as the most powerful of the growth promoters because they affect internode growth (Wright, 1993). On a note of health and safety, Mark reports that the regulator does not require specially protective measures. "All Calderdale's operators wear personal protective equipment, namely a Hi Vis spray suit, waterproof boots and Neoprene gloves. No risks to the environment are expected from the use of gibberellins because," says Mark "they do not harm animals or plants in the tiny amounts used - they act as plant growth enhancers, and they are broken down naturally in the environment." From the standpoint of resources, the trials will consider a number of factors. • The resources required, such as buildings, equipment, staff, materials and management time. • Increased staff involvement, understanding and training. Mark, whose trials work is helping him gain a BASIS amenity pesticide certificate, seems far too modest to claim major credit for his innovative applications, although members of Woodvale Bowling Club may do that for him if the trials progress as he expects them to. However, they may be in for a shock as well. "The members have approached the trials with an open mind, which is very encouraging. However the impact of the growth regulator may be to turn what were slow greens into fast ones." The impact that such a transformation will have on the traditions of bowling at Wellholme remain to be seen but they are certainly in for changing times in more ways than one. "My wish is to try to interest more youngsters in bowling," he says. "and the members of Woodvale may be able to help me achieve this." Never one to stand still, Mark is already planning his next application for the growth regulator. "If everything goes well, I'll be looking at football pitches next. If using the growth regulator also strengthens the turf, it is less likely to be cut up by players."